My review: 3.5/5 "Despite its title, the book is more than yet another discussion of how a segment of the Italian society is getting a disproportionate access to taxpayers'-funded resources (i.e. a follower of Rizzo, Stella ""La casta""). Interesting and well documented book: six years later, it is still relevant- albeit, of course, specifics might have changed. 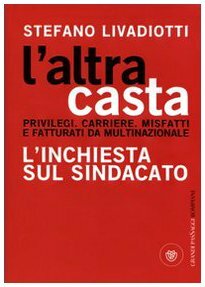 Probably due to the pervasiveness of (current and past) Trades Unions representatives, the book has to actually review issues such as the Italian pension system, State bureaucracy, the continuous generation of new watchdogs (interesting the concept that each peasant in Italy is matched by one employee in State and local authorities supposedly focused on agriculture), etc. The most interesting part is probably the last one, as the author reviews how are managed companies that are currently (2014) scheduled for partial privatization between 2014 and 2015 (e.g. Alitalia, Poste, Trenitalia), as well as few organizations that are being refocused or restructured (e.g. Bank of Italy and INPS). Sometimes the comments are entertaining yet a little bit draconian and biased, but anyway the book is a page turner. The assertions that I disagree with are generally those that apply basic algebra ignoring that the number of employees is not necessarily linked to patronage and corruption, but also to the complexity of processes, rules, and regulations that have to be applied e.g. both in Lombardy (a Northern region whose per capita income is above average) and Molise (a poorer Southern small region). The overbloated bureaucracy is both due to self-referential rules (in Italy, we keep adding watchdogs overseeing or replacing and expanding on existing watchdogs) and sympathetic support from Members of the Italian Parliament that magically convert each initiative to streamline bureaucratic overload into further opportunities to... expand bureaucracy. Lopez ""La casta dei giornali""
Veltri ""I soldi dei partiti""